Stratasys has launched a pilot program with the world’s largest home-improvement retailer Home Depot to sell MakerBot 3D printers and bring 3D printing to the mainstream market. Stratasys acquired MakerBot in 2013 for over $400 million. According to the press release by Stratasys, MakerBot’s products – which include the award-winning MakerBot Replicator line of 3D printers with the MakerBot Replicator Desktop 3D Printer, the MakerBot Replicator Mini Compact 3D Printer, the MakerBot Replicator Z18 3D Printer, the MakerBot Replicator 2X Experimental 3D Printer and the MakerBot Digitizer™ Desktop 3D Scanner – will be available for purchase at six Home Depot stores in California, four in Illinois, and two in New York. Customers can find the MakerBot products in specially designed kiosks that will encourage visitors to experience the wonder of 3D printing firsthand. This is truly a historic event as Home Depot is the first ever retailer to offer 3D printers. “We are thrilled to partner with The Home Depot to help bring MakerBot 3D printing technology to Home Depot customers. Imagine a world where you can 3D print replacement parts and use 3D printing as an integral part of design and building work. Every day we see the magic of 3D printing becoming a reality with our customers; now The Home Depot can also see that magic. We can’t wait to see what The Home Depot customers make with our products,” said Bre Pettis, CEO of MakerBot. “We are continually looking to bring the latest innovation to our customers and are excited to offer MakerBot 3D Printing products in select stores and on homedepot.com. MakerBot 3D printers are yet another great technology that can serve particular needs of specific customers,” said Joe Downey, Merchant, The Home Depot. Stratasys was focused on building larger industrial-use 3D printers before it acquired MakerBot. Now, the company aims to make a big move into the consumer market. The deal between Stratasys and Home Depot was announced on Monday. 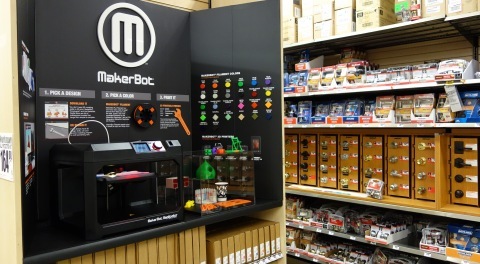 Atlanta-based Home Depot began selling MakerBot units online three months ago. The retailer expects that the printers could be popular among contractors and home tinkerers.